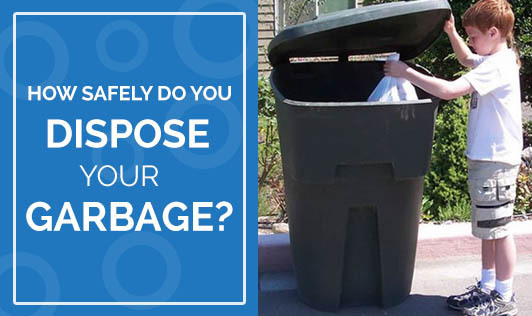 How Safely Do You Dispose Your Garbage? The amount of wastes produced is increasing at an enormous rate. As the lifestyle standards get higher, the quantity of waste produced increases too, especially in the urban (and/or developing) areas. Solid wastes like paper, food scraps, food leftover, sewage, sludge, industrial refuse or street sweeping cause enormous filth and can lead to outbreak of various diseases. We as individuals or individual families at home can contribute our bit in waste management by disposing of waste safely. 1. Segregate waste into dry waste (paper, glass, cardboard, etc.) and wet wastes (kitchen waste, garden waste etc.). 2. Do not dump kitchen waste in the sink. 3. Train inmates of your house to segregate dry and wet waste. 1. Place a bin liner in the wet waste collecting bin. 2. Keep bins clean and dry. 3. Use foot operated pedal bins to avoid picking up germs. 4. Outside bins should have tight fitting lids to prevent infestation of rodents, insects and flies. 5. Disinfect inside of the bin regularly using a disinfectant. 6. Wipe or spray the lid of the bin with a disinfectant spray or disinfectant cleaner. 7. Wash your hands thoroughly after touching the bin. -wrap waste organic food to avoid germ build up. -follow local guidelines for recycling. 1. Buy goods with little or no packaging or packaging that can be recycled. 2. Use permanent cloth bag for groceries or reuse strong plastic carrier bags instead of buying more. 3. Reuse items such as glass bottles, tin cans, paper or plastics instead of dumping after a single use. 4. Make compost for your garden from kitchen waste and garden waste. 5. Repair an item instead of replacing it or give it to a person who is in need. By following these simple steps, we can keep our environment clean and safe by avoiding outbreak of deadly diseases. After all, home is the best place to start making a difference. Start reducing, reusing and recycling materials to decrease household waste!